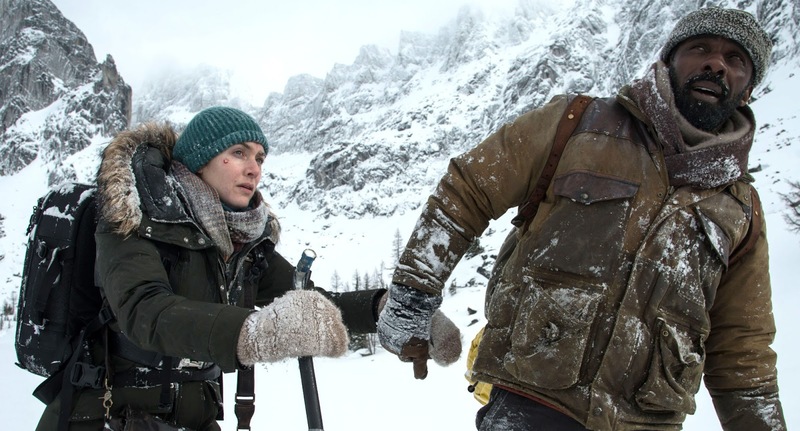 For many women getting stranded in the mountains with Idris Elba doesn't seem like a bad thing. This romantic disaster movie directed by Hany Abu-Assad and written by Chris Weitz and J. Mills Goodloe was adapted from the 2011 novel of the same name by Charles Martin. At one time Michael Fassbender was set to play Dr. Bass, then Charlie Hunnman with Margot Robbie as Alex, but she dropped out and then it was Rosamund Pike. Hard to imagine any of these pairings because Idris Elba and Kate Winslet really elevate this tale of love and survival from just being another Hallmark movie of the week. Dr. Ben Bass was at a medical conference in Idaho but an impending storm has cancelled all flights going out. He has an important surgery to perform in the morning. Photojournalist Alex Martin is also desperate to leave as her wedding is the next day. Overhearing his blight, Alex suggests they hire a private plane. Walter (Beau Bridges) is the pilot of the charter plane says he doesn't have to file a flight plan and he can out run the storm. The pile on board with Walter's dog flying over the snow covered mountains of the High Uintas Wilderness. Unfortunately the storm seems to have taken a turn and is now catching up and Walter is having a stroke. They crash land and Walter does not survive, Alex's leg is fractured, Ben has broken ribs, and of course the dog seems to be OK. No flight plan means that no one knows they are there. Neither one had time to call anyone before they left. The tail section of the plane blew off before crashing so the beacon is missing. Dr. Bass is resourceful and applies first aid to Alex's leg although she is still unconscious. If one crashes, it's good to have a doctor on board. He buries Walter under the wing of the plane. Makes a fire with the chair stuffing. When Alex wakes, she is of the mind to go somewhere that has phone access and maybe civilization. More pragmatic Ben thinks they should stay and wait for help. In the end, they end up getting off the top of the mountain heading for the treeline. Enduring freezing cold weather, injured leg, deep snow and endless walking, they learn to trust each other despite they very divergent personalities. Alex talks about her fiance and wonders why Ben doesn't talk of his wife. Alex stole a look in Ben's wallet and listened to his voice recorder that had a cryptic message from his wife. After about 3 weeks they find a deserted cabin with a couple cans of soup. Alex had fallen into a pond when the ice broke and Ben nurses her from hypothermia. It's there they give into the chemistry, but they realize they still have to find a way out. Fortunately they eventually find a logging camp and after recovering they go back to their lives. And Ben, who didn't like the dog to begin with, ends up with him. Once they are back they realize that their survival time has forever marked them. The movie can only end with a big heart mending reunion. How can you not like getting back with Idriss? And the dog is cute too.